Fourth of July in Atlanta was a wash. Literally! The rains moved in on Thursday and lingered throughout the day on Friday. Any plans for a cookout circled down the drain. Fortunately we didn’t have big plans for the day so I decided to stay inside and make tacos along with my quick and easy version of chipotle black beans. Most of our friends were travelling for the Fourth, so our low-key evening included tacos at home, a 7:30 showing of World War Z at Midtown Promenade, Centennial Park fireworks on Channel 2, and pillow time at 11:00. Boring? Nah! Sometimes it’s great having a laid back holiday. Tacos these days are ubiquitous and almost every restaurant that we frequent includes some variety of them on the menu. Fish tacos always grab my attention and I’ve got to admit that I opt for the fried variety on occasion. However, if you make wise choices with ingredients, tacos can be quite healthy. Sauteed shrimp, grilled chicken, and pork tenderloin all make great taco ingredients. Add some vegetable or fruit accompaniment and a little dressing and it’s a self contained meal. I really love the combination of ingredients in these tacos. 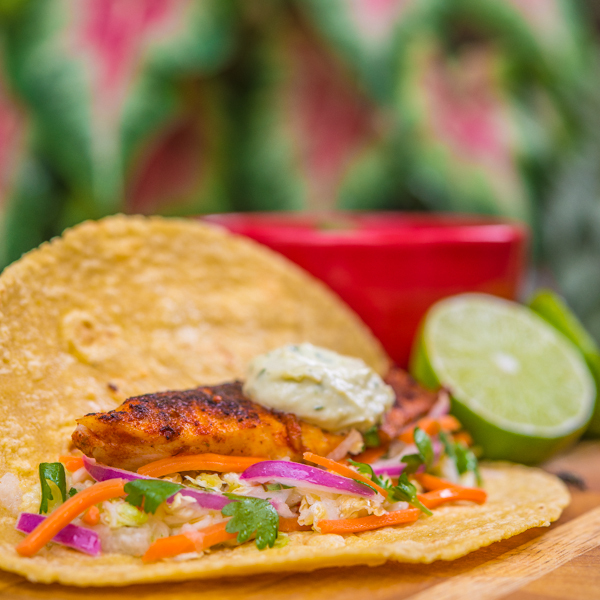 The slight heat of the tilapia is cooled with the jicama coleslaw and avocado aioli. A side of black beans makes this a great Mexican meal. These tacos come together quickly enough for a week night family dinner or they make a festive main course for a Latin style dinner party. Serve these tacos with ice cold margaritas and your guests will be very happy. Salud! Place avocado, mayonnaise, sour cream, garlic, lime juice, and salt in the bowl of a food processor. Process until smooth. Transfer to a bowl and set aside. 1. In a large bowl, combine cabbage, carrots, jicama, and onion. 2. In a small bowl, whisk together lime juice, honey, vinegar, chipotle seasoning, and salt. Slowly add oil and whisk until well combined. 3. Fifteen minutes before building the tacos, add the dressing to the coleslaw. Mix well and set aside. Add cilantro immediately before serving. 1. In a small bowl, combine paprika, salt, pepper, garlic powder, onion powder, thyme, and oregano. 2. Slice tilapia filets in half, lengthwise. Slice thick side of filets crosswise at a diagonal. Liberally season both sides of tilapia with spice mixture. 3. Heat oil in a large non-stick skillet. Cook tilapia two to three minutes on each side. Fish will start to flake when pressed when it is done. Thicker pieces may take longer. To assemble tacos, spoon coleslaw on one side of tortilla. Top coleslaw with one or two pieces of fish and avocado aioli. 1. In a large pot, brown bacon over medium high heat. Add onion, bell pepper, and garlic to the bacon. Saute for 4 to 5 minutes. 2. Add black beans, tomatoes, chipotle peppers, salt, and cumin. Mix well, reduce heat, and simmer for 30 minutes. PS – your chocolate labradoodle looks like she could be our Portuguese Water Dog’s long lost sister – same yummy color and curls. I made them, they are super delicious everyone loved them in my family! So glad you enjoyed them! Thanks for letting me know. These look delicious! I love fish tacos with a good coleslaw – definitely need to try these! I’ve made jicama coleslaw, but it’s been years – I need to again. These are great looking tacos. I haven’t made fish tacos at all this year, and need to! Fun post – thanks. These tacos are so good and the chipotle black are delish. The pictures do perfect justice. Hi Bill, may I have a taco, please? Yum….